“Central Subway Is Going to Extend to Washington Square!”? Well, Not Really. In addition to the predictable street food and drunken antics, revelers at the North Beach Festival this year were in for a surprise: an extra stop on the contentious Central Subway, all North Beach’s own. Flyers declaring “The Central Subway is Going to Extend to Washington Square!” were handed out to visitors to the San Francisco Municipal Transportation Agency’s booth, according to Jon Golinger, president of the Telegraph Hill Dwellers and a staunch opponent of the subway. The flyers included a map of a Central Subway with a Washington Square stop at the end of the 1.8-mile, $1.6 billion project. The problem is, of course, that there are no plans to extend the Central Subway to Washington Square. Transit officials were using the flyers as a “misleading” way to win support for the subway among North Beach residents and merchants, many of whom are upset over plans to temporarily close a small part of Columbus Avenue during construction, Golinger said. As per the current plans awaiting federal funding, the last stop on the subway is on Stockton Street in Chinatown. The subway does go to North Beach, in a sense, but not with passengers: the drilling equipment is scheduled to exit the ground at Columbus Avenue and Union Street — a contentious issue in the traffic-heavy tourist neighborhood — and transit officials have said that extra stations are a possibility in the future, but there’s no Washington Square station planned. The SFMTA invited SPUR to share space at the transit agency’s booth at the North Beach Festival, which is where SPUR distributed the flyers, Taber said. 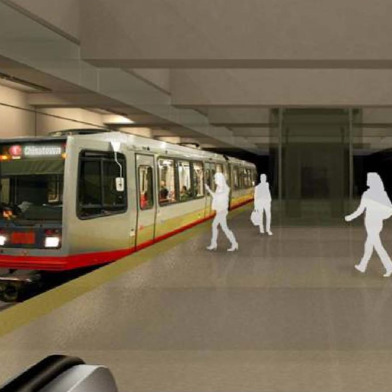 SPUR hopes to convince the SFMTA to extend the subway another four-tenths of a mile with a study, funded by the nonprofit and conducted with help from SFMTA transit experts. Planning sessions on the study will be in the fall, with release of the study by the wintertime, Taber said. The flyer and the booth had a warm reception. “We had more than 150 people express support for the extension and only 4 who had negative comments,” Taber said. Muni officials as well as SPUR volunteers handed out the flyer to festival-goers. John Funghi, the Central Subway’s project manager, handed Golinger his copy, Golinger said. A spokesman for the SFMTA did not respond to a request for comment on Tuesday. A few weeks ago, Muni officials oversaw a “raucous” meeting with North Beach residents, who were surprised and angry to hear that the subway boring machine would be exiting the ground in their neighborhood. That fact had been available for public knowledge in public documents, but nonetheless Muni officials were criticized by Board of Supervisors President David Chiu for springing the news on the neighborhood in an “unacceptable” fashion. Golinger has been mentioned as a possible challenger to Chiu, a subway supporter who represents the area. Golinger circulated a petition Monday in an attempt to force Chiu to introduce an emergency resolution at the Board to halt subway construction. That may not be “legally feasible,” Chiu wrote in a letter to SFMTA Director Ed Reiskin. In any case, the neighborhood sentiment is clear, Golinger said. “We want to hit the pause button on the tearing up of North Beach,” he said.